Hi Susannah, much love from India. I have been reading for blog for while now. I was part of the last Unravelling course you offered too. Your wisdom and sensitivity gives me the space to open up spaces within me. I have a question. When you read so much (as I do- our reading lists are very similar:) ) and read online so much (as I do too), how do you eventually access your own wisdom? I have been meditating for a while now and am struggling with grief that has left a gaping hole in me. I feel inadequate quite often. I also feel that my grief is worn so close to the surface and yet no one sees it. 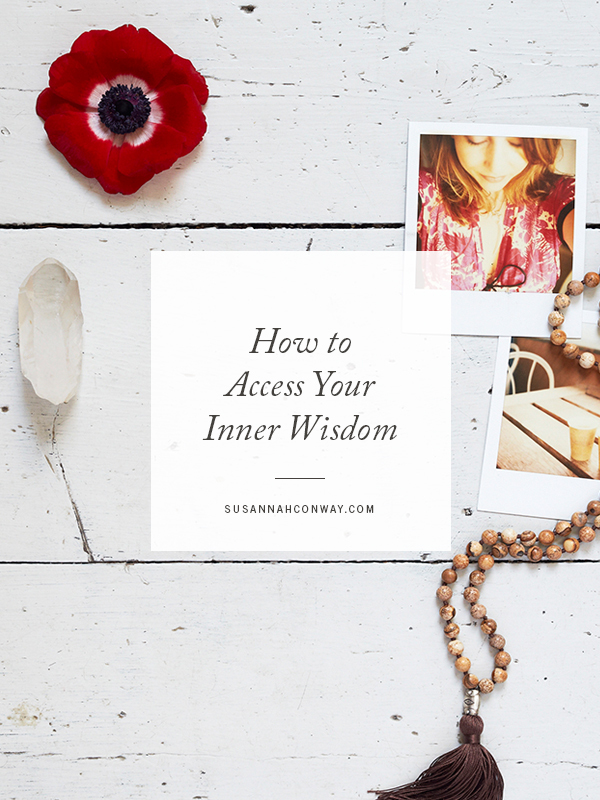 How do I access my wisdom? I do believe that each of us has all the answers we need inside of us, but you’re right to wonder how we access that. We live in such a noisy world. There are a lot of other people telling us how to live and how not to live. There are rules to follow and responsibilities to fulfil. We’re blessed with these incredible brains full of memories and dreams, but the fears and doubts so often get in the way. As a textbook overthinker, I battle with this every day of my life. If I was to sit down and try to access my ‘wisdom’ all I’d hear would be thoughts, so I have a few tricks that help me side step my overthinky brain and tap into the part of me that’s far wiser than the face I show the world. It starts with a piece of paper and a pen. Without a doubt journalling is one of the fastest ways to get to know who you are on the inside. You can use paint and collage, write gratitude lists, use prompts and keep five-year diaries — and all of that is fantastic — but the method I return to again and again is the simple act of writing stuff down, stream-of-consciousness style, in a notebook. I write the date at the top of the page and then scribble down whatever is on my mind. It might end up being three pages of hormone-fuelled angst or a paragraph outlining an idea that came to me over breakfast. I don’t journal every day but I’ve made it my practice to check in with myself in my journal at least once a week, usually more. I don’t write anything particularly profound — most of my journalling reads like a messy brain dump. Getting into the habit of journalling — however that looks for you — is the doorway to accessing your inner wisdom. In that way it’s a bit like meditation: for the first few minutes after I’ve closed my eyes I’m like a dog trying to get into a comfortable position. My neck suddenly itches, my hands feel cramped. My head immediately fills with everything I must do and my monkey mind jumps around wanting to be let out of the cage. But after a few minutes of letting myself settle, things quieten down and I can bring my focus to the mantra, if I have one, or I simply ‘sit back’ in my head and pay attention to the space inside me (best way I can describe it). If I’m lucky that’s the point when I start to feel more connected to the bigness of everything, but even if I don’t get there, I still feel calmer when I eventually open my eyes. Another really powerful journalling technique is dialoguing, where you write out a dialogue between you and another person/place/feeling/part of yourself, writing both sides of the ‘conversation’. For example, you could write a dialogue between you and the ache in your foot. Start with: Hello foot, why are you aching? What are you trying to tell me? And on the next line write out a response from your foot, going back and forth until you come to a natural pause. You could have a conversation with anything you want more clarity about — a colleague at work. Your house. Your fear about a certain situation. You could even bring out the big guns and have a conversation with God/the universe/your idea of a higher power that means something to you. Ask a direct question and then write out the response. The other journalling technique I use a LOT is letter writing. Like the dialoguing, you can write letters to people, places, things, feelings — anything and everything, really — but it’s especially powerful when you write a letter to yourself as yourself. Try writing a letter as your future self, one year older than you are now. Or five years older. Or as your 80-year-old self. What does she have to say? What clarity can she share about your current situation? I like to imagine that my future self knows a heck of a lot more about the world than I do, so when she ‘writes’ me a letter I feel I’m accessing the part of me that’s wise and loving. Doesn’t matter that it’s the me of today who’s writing it — I’ll often read a letter back and wonder where did that come from?! Sometimes it’s magical, sometimes it feels a bit silly, but it’s always useful. I journalled everyday for the first few years of my bereavement and alongside my weekly trip to see my therapist and my eventual artist dates with my camera, these helped me heal and move forward in my life. I’ve been journalling for 30 years, but it wasn’t until I was plunged into grief that my journalling started to go deeper. I had more questions and desperately wanted to find some answers. I didn’t find the answers I wanted, but I did start to unravel the answers I needed. I didn’t meditate during those years — I sat with my mind in a very different way — but I can tell you that these days I find the journalling I do after meditation is often quite profound, so keep a notebook by your side when you meditate and jot down anything that comes to you, no matter how small. The journalling ideas are beautiful, Susannah. Thank you so much. The email came to you after I read one of your deeply moving newsletters. It made my deep need to access my own wisdom even more keen. Your voice and your words have a powerful and magical effect. I hope you know what a gift you are. Writing in a notebook/journal is definitely a way to tap into your own wisdom, and thanks for the journal tips you shared in depth here, Susannah. I wrote everyday during our Sacred Alone course, and I have learned a lot. But I have to be honest with you that I haven’t kept up with the journaling. I’m not sure why. Is it because I lack the motivation, or the history of teachers reading my journal and gossiping about me are still bugging me? May I ask about the Journal Your Life course, how much time, approximately, do we spend each day on the course? Thanks. I began journaling at age 8. Oddly, I stopped during the years I was married and had children, but during the trauma of divorce, I began again and will never stop at this point. I love the idea of writing a letter to my younger or older self. I have a lot of questions for them, especially my older self as I seem to have a block in pursuing my dreams right now. I feel the answer is just out of my reach, but it must be there. Maybe my older self can help me find my way. You really are a gift. How thoughtful of you to share this moving letter with all of us. Visiting here is always a great inspiration to take the time to journal. I took your advice today and it was just amazing what I needed to tell and say – and find out, finally. Thank you! !